On January 8, Gazprom put into operation an offshore gas receiving terminal and the Marshal Vasilevsky Floating Storage and Regasification Unit (FSRU) in the Kaliningrad Region. The event caused great interest in Russia and Europe, although its true meaning was not always adequately understood. First of all, many commentators underscored the desire of the Russian Federation to avoid traditional gas transit risks. 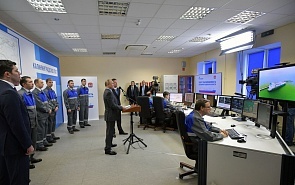 It seems that the statement of Gazprom’s head Alexei Miller during the terminal launch ceremony was somewhat misunderstood: “The gas supply system through the Minsk-Vilnius-Kaunas-Kaliningrad gas pipeline has been completely shut off, and gas supplies to the Kaliningrad Region are currently fully implemented through the marine terminal.” The system was shut off only for the period of testing of the terminal and regasification unit. Nobody was going to stop gas supplies through the Minsk-Vilnius-Kaunas-Kaliningrad gas pipeline. Moreover, according to Miller, by the beginning of summer 2019, the annual transit volume will reach 3.280 billion cubic meters. Gas consumption in the region is steadily growing. According to Anton Alikhanov, governor of the region, in 2018 gas consumption there reached 2.608 billion cubic meters. The underground gas storage infrastructure is being expanded. In recent years, Gazprom built several underground natural gas storage facilities in the Kaliningrad Region with a total capacity of 3.4 billion cubic meters. According to Governor Alikhanov, the regional underground gas storage will be filled with gas supplied via the Minsk-Vilnius-Kaunas-Kaliningrad gas pipeline. Total investment in the project amounted to approximately 780 million euros. The capacity of the floating terminal is 2.8 billion cubic meters, which is comparable with the current gas consumption in the whole Kaliningrad Region. To provide gas to the terminal, the South Korea-built Marshal Vasilevsky special FSRU vessel (tanker) is used, which is able not only to transport LNG from the shipping terminals, but also to receive the so-called “dry stripped gas”, i.e. standard fuel suitable for storage in underground gas storages and use for its intended purpose. Experts paid less attention to the geostrategic meaning the Marshal Vasilevsky FSRU, although in modern conditions the “mobilization” context of the event could not be overlooked. For example, the German Junge Welt newspaper wrote that Russia is trying to eliminate possible risks associated with the raw materials blockade of the Kaliningrad region, which does not have a land border with mainland Russia: from now on the region is technically completely independent from the natural gas pipeline transit through Belarus and Lithuania. Russian analysts also pointed to the similarity in creating an alternative gas supply system for the Kaliningrad Region and other projects designed to ensure reliable communication between the Russian regions even in case of critical developments on the country’s borders. In particular, these are the well-known Crimean Bridge, and the railway bypassing Ukraine. It is difficult to wait for maximum efficiency and high profitability from the projects, which are in fact mobilization-type. At the same time, the Kaliningrad facilities will not be completely unprofitable: the capacity of gas storage facilities may be in demand for export deliveries to neighboring regions during the periods of peak loads. The November developments in the United States and on the spot market in Europe showed that during such cold-weather emergencies LNG prices may rise to an unprecedented level. Thus, the floating terminal and the launch of the re-gasification unit in the Kaliningrad Region has a number of various features. Tests were successfully conducted on an alternative gas supply system to the Russian exclave. The energy blockade of the Kaliningrad Region in case of transit and geopolitical risks in the zone of the Minsk-Vilnius-Kaunas-Kaliningrad pipeline looks quite impossible.